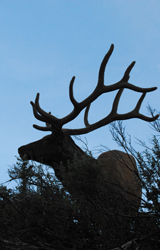 Under the provisions of the Arizona Revised Statutes 17-231, the Arizona Game and Fish Commission establishes policy for the management, preservation, and harvest of wildlife. The Commission makes rules and regulations for managing, conserving, and protecting wildlife and fisheries resources, and safe and regulated watercraft and off-highway vehicle operations for the benefit of the citizens of Arizona. In support of the Commission’s obligations, the Director, as chief administrative officer, provides general supervision and control of all Department functions and activities. Commission agenda for upcoming meetings. Meeting minutes of previous meetings. Live webcasts of commission meetings. Commissioners’ Forum – Commission’s stance on various issues affecting wildlife conservation. The Commission is composed of five members appointed by the Governor pursuant to ARS 38-211. The Commission appoints the Director of the Arizona Game and Fish Department, and the Director serves as secretary to the Commission. No more than one commissioner may be from any one county. No more than three may be from the same political party. Each commissioner serves a five-year term, staggered. Commissioners customarily serve as chairman during their last year.